A German study (published in Pediatrics last April) recently caught my attention. Three thousand second- and third-graders were weighed and asked what they drank. Then, over the course of one year, their teachers were given lesson plans to educate students on the value of drinking water. The students were also given water bottles and encouraged to use them. The results? Kids in the schools where drinking water was encouraged were 31 percent less likely to be overweight than those who were not. Kids of all ages need six major nutrients: carbohydrates, fat, protein, vitamins, minerals and water! The first three nutrients listed hold caloric value; the latter three do not, but they do provide essential functions to make our bodies perform. More than 60 percent of the human body is composed of water. 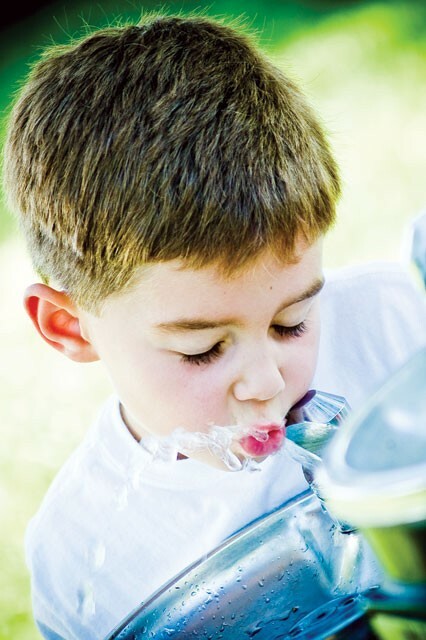 A child who weighs 80 pounds holds six gallons of water. Every cell needs water to dissolve and transport vital nutrients. Water regulates body temperature and cushions human organs. A loss of just 5 percent of body fluid can cause headaches, fatigue, confusion and even elevated heart rate. Marketing bombards children to consume soda, sports drinks and even coffee beverages instead of pouring a glass of water. Many of these options are loaded with extra calories and have very little nutrient density. All hydration doesn’t have to come from gulping water, though. Remember that the foods we eat also hold water. Watermelon and grapefruit are obvious, but other fruits and vegetables also add to hydration. In fact, the average American consumes four cups of water each day in the form of foods. So instead of supplying sugary drinks to boost energy and hydration for tired kids, why not offer crisp cold vegetables with a tasty low-fat ranch dip? Or get out the blender and whip up a smoothie with a selection of low-fat yogurts and fresh fruits. You’ll find that an orange, peeled and sectioned, will quickly disappear when provided. However they get it, healthy kids need water. — Retired Navy Rear Admiral James Barnett Jr. commenting on a study by the bipartisan, non-profit organization “Mission: Readiness” that shows weight problems are the number one reason military recruits are rejected. The “Mission: Readiness” study estimates that 9 million young adults, or 27 percent of all Americans ages 17 to 24, are too obese to be accepted to military service. Barnett says reversing the childhood obesity epidemic is crucial to national security in the next 20 years.